22”And almost all things are by the law purged with blood; and without shedding of blood is no remission. A most solemn time approaches that all men and women who have professed Jesus Christ, as our Lord and Savior, observe what the Son of God did for all mankind by making Himself the Supreme sacrifice to give us justification before a Holy God, our Father. Jesus was called by John the Baptist most truthfully when he saw Jesus walking near-by. 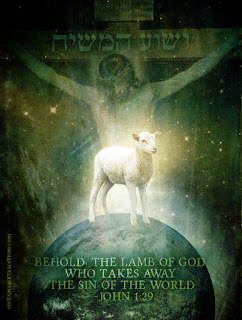 “The next day John seeth Jesus coming unto him, and saith, Behold the Lamb of God, which taketh away the sin of the world. John the Baptist came in the spirit and power of Elijah, to proclaim the coming of our Lord, and made His pathway straight. Jesus was truly the Lamb of God, and during this time of year, we memoralize in contrite, humble and thankful hearts that Jesus loved us, before we loved Him. .. But what of this sacrifice that Jesus made. Many scoff at the notion of one Man being able to cleanse a person of their sins and make them whole again before an Almighty God. Even in the ancient days after this act of unselfish love was completed, men couldn't not fathom why this new Christian sect was behaving such as they were. One of the crimes that was ascribed to the early Christians was that Christian worship services included the practice of cannabalism. Christians were labeled to repeat the sacrifice of Jesus and then eat the body and drink the blood of its victim. It's all very vague, but all that the Roman population knew about Christianity was that it place a huge emphasis on the value of blood sacrifice. Even today, in our so called “modern” world it is still slammed by its critics as a bloody religion because the Bible seems to be so obsessed by it. As the opening verses attest, the Bible is dependent on the blood, “for without blood, there is no remission of sins”. Without the shedding of blood, can there never be forgivenes, there can be no regeneraton, no peace, no joy, no rest, no hope, and certainly no Resurrection from the dead. Through out the whole of the New Testament, Jesus is portrayed as that sinless “LAMB of GOD” and the title is always associated with His atoning work on the Cross, in which He shed His precious blood as full payment for the sins of the world....for your sins, for my sins. Remove the Blood Doctrine of Jesus shedding His blood and the Doctrine of Atonement goes with it. If one breaks down the word Atonement into its component parts, the word defines itself according to its original meaning “At One Ment” We are made at one with God the Father through the sacrifice of His Son. We were separated from God through our first human parents, Adam and Eve, when they chose to rebel against the only commandment that was given to them. Adam and Eve were told that the penalty for breaking God's command not to violate the Tree of Knowledge was death. God made provision for their sin, killing two animals and covering their nakedness with their skins. That was the first blood shed to cover sin, and God set up a system of sacrifice whereby the blood of bullocks, goats and lambs kept that one Great Object Lesson before the people. Sin has a blood penalty, and the penalty must be paid. In Genesis Chapter 15, we find Abram questioning God's promise that his seed will be numbered as the stars of heaven and that they would inherit the land to which God had led him.....Not that Abraham didn't have faith that God was able to do exactly what He said He was going to do, but wanted to know how would this be accomplished. ..Remember the story? 3”And Abram said, Behold, to me thou hast given no seed: and, lo, one born in my house is mine heir. 4And, behold, the word of the LORD came unto him, saying, This shall not be thine heir; but he that shall come forth out of thine own bowels shall be thine heir. 5And he brought him forth abroad, and said, Look now toward heaven, and tell the stars, if thou be able to number them: and he said unto him, So shall thy seed be. 7And he said unto him, I am the LORD that brought thee out of Ur of the Chaldees, to give thee this land to inherit it. 9” And he said unto him, Take me an heifer of three years old, and a she goat of three years old, and a ram of three years old, and a turtledove, and a young pigeon. 10And he took unto him all these, and divided them in the midst, and laid each piece one against another: but the birds divided he not. 11And when the fowls came down upon the carcases, Abram drove them away. A blood covenant was, by common custom, a joining of 2 or more persons, families, clans, tribes, or nations, where the participants agree to do or refrain from doing certain acts. More specifically, God had proposed a patriarchal covenant. The patriarchal form of covenant is a self-imposed obligation of a superior party, to the benefit of an inferior party. In this form, the terms the parties use to refer to each other are: father and son. God's proposal included not only Abram, but extended to Abram's seed forever. Abraham waited for God to show up so they could bind the covenant between them. But as night began to fall, Abraham became sleep and great sleep fell upon him. As Abraham slept, he awoke to see what was happening and the Bible records it. Althought the covenant was between God and Abram (and the seed God promised would fill the earth, as the stars of heaven), God signed on both sides of the covenant, thereby binding Himself to both parts. As history sadly records, Abram and his seed did not remain faithful to this covenant, and the penalty for violating a blood covenant was death. God knew before the foundation of the world, that man was not able to keep this blood covenant, nor had the ability to save himself by any action on his part. So God stepped out of eternity and entered into our space and time, to keep the provisions of the original blood covenant and be a true Son, as it demanded. And having kept its terms on behalf of sinful humanity, it was incumbent upon Him to make payment, as justice demanded, for its violation by those on whose behalf the covenant was signed. It nearly breaks my heart when I comtemplate on that I put my Lord Jesus through such a torture for the like of one such as I. Even as a small boy, when read from my mother's bible story book and we read the details of what Jesus allowed Himself to endure, it brought tears to my eyes...and you know...it's still does when I ponder such great love and the suffering He went through, just to save a worm like me. 5"But He was wounded for our transgressions, He was bruised for our iniquities: the chastisement of our peace was upon him; and with His stripes we are healed. It may seem a bit unclear, as to how can an innocent man assume the guilt of anther and call it justice? Thinking on that premise, when a person becomes a Christian, he becomes a part of the Body of Christ. He is joined with Christ, and indwelt by the Holy Spirit. He becomes 'one with Christ'. Let's make a real life example, that may or may not have actually happened, but illustrates the point. Suppose a debt ridden widow lived next door to a millionaire. Her debts could not be justly charges to him. BUT, if he was to marry her, legally and justly, he assumed the responsibility for both her assets and her debts. Then speaking of sinful mankind who was dead in their sins, because of the transgressions of the law, because that is what sin is. 12 “And the law is not of faith: but, The man that doeth them shall live in them. (although none of us could keep the law) emphasis mine. The "Tree" that Christ hung on was the CROSS. We are therefore DEAD to the Law: not physically dead, but JUDICIALLY dead, for the "Penalty" of a law cannot be exacted twice. If Jesus "bare our sins in His own body upon the Tree" (1st Peter 2:24), then they are no longer upon us and we are free from sin. The death of Christ was no mere accident or incident, it was predetermined from the foundation of the world. Nothing but the blood of Jesus; What can make me whole again? Nothing but the blood of Jesus. . .
Oh! precious is the flow; That makes me white as snow; No other fount I know . . . If you contemplate the wonderful words that show how Jesus was foreordained to be the propitiation or substitute for our penalty that was most deserving for each one who has transgressed God's Holy Law, as sin is the transgression of the Law, then you can see, that the only remedy for our redemption was in a blood covenant satisified in justice before a Holy God. It was the death and resurrection of our Lord God, Jesus Christ for the payment for our sins, once and for all. One time, for all eternity was this payment made, when Jesus said “it is finished” it was most certainly completed. What were those ordinances that were against us and what did He nail to His cross...? Our sins, the penalty of those sins that condemned us to the same kind of death as those sacrficial animals. Jesus paid the ultimate price. And during this season of the coming “Passover of God” let us humble ourselves and give thanks and rededicate ourselves to serving a Great God and King, our Lord Jesus Christ...don't just take those emblems of what Jesus did , without a deep reflection of the enormous gift that He gave to each of us, written in His own Blood. “ 16For God so loved the world, that he gave his only begotten Son, that whosoever believeth in him should not perish, but have everlasting life.